Happy March Everyone! This will be the final Winter Share delivery. What next?! Sign up for the Summer/Autumn 2014 season! Right now, you can sign up for vegetable and fruit shares, and very soon, you will be able to sign up for special product shares. Happy New Year Everyone! Here’s what to expect at pick-up this evening, plus we’ve got some fun stuff going on this month—scroll down! Briermere Farms has generously donated us a Summer Fruit Share for the upcoming season–that’s a $140 value! The fruit share runs for 16 or more weeks, usually beginning in July. Members receive 1-2 kinds of fruit a week from Briermere Farms, including a variety of berries, apples, pears, & peaches. We’ll be selling tickets during this week’s pickup (1/9) and the following pickup (1/30). Tickets are $5 for 1, $10 for 3, and $20 for 10. Please bring cash. All ticket sales support our subsidy program, which offers reduced-cost CSA shares for families who want to eat healthily but could use a little financial help. For more info on summer fruit shares, check out our website. The Annual Member Survey will be distributed via email soon. Please take the time to give feedback! Remember, it’s OUR CSA! Sign-ups for returning members will start at the Town Hall. You can now order many individual items from our partners at Winter Sun Farms and Acorn Hill Farms! À la carte items are priced and ordered separately from the regular Winter Shares, so just add a few more to your veggie delivery and maybe skip the grocery altogether! Winter Sun has frozen veggies, eggs, meats and other items (see list below). Acorn Hill specializes in cheese, fudge and soap made from goats milk. Pick-up will be during our regular Winter Vegetable Share time: 5-8pm on December 19, January 9, January 30,February 20, March 13. If you want to be part of their Egg Share, this is the point where you can join. It’s $5.75 for a dozen eggs (free range, antibotic & hormone-free), and you’re getting 1 carton at each of our 5 delivery dates. Please note: You can always order eggs from Lewis Waite Farm, too (they offer 100% organic eggs that are a little more expensive and free-range eggs (just like these) that are a bit lower in price.) We’re not endorsing either one, just offering you more options- pick whatever works best for you! Create or login to your account. Please note: Winter Sun Farms uses a site called Farmigo to run their store. Farmigo happens to be what Village Fishmonger uses for the fish share, too. If you already have a Farmigo account (either through the fish share or some other place) you don’t need to create a new account, just log in- however, you can’t access your Village Fishmonger account through your Winter Suns account or vice versa. So you have one master Farmigo account, but you log into different food vendors separately. Makes sense? Once you’ve created your account and paid up (there’s no fee if you’re just adding access to their webstore; you only have to pay if you’re electing the Egg Share) you should find yourself on their main page. If you want to actually go to their webstore and order items, you have to click on the tiny green Web Store link on the upper right-hand corner next to your name. See it? Click it! You can now add any products they offer, which will vary from pickup to pickup. (Scroll to the bottom of the email for a full list.) The order deadline is always 3 days before delivery- so order by the 16th for our December 19th date! Click to their product page and read all about their goat milk products: cheese, fudge, and soap! They also offer different cuts of Chevon! Order all you want, proceed to their pay pal checkout (you don’t need a pay pal account) and remember to note what CSA location and Date you are ordering for (as indicated in their ordering instructions.) ORDER DEADLINES are five days before the delivery date. If you miss the deadline, you won’t get the order processed in time! Strawberries – a 10 lb. box! Expanding Food Options This Winter! Sign up for a simple, 5-delivery, Winter Fish Share. The deliveries will be the same as our winter vegetable delivery dates. You can also add extra seafood items such as scallops, oysters, and lobster to any or all of your deliveries! You can choose a small share (1lb.) for $75 or a medium share (2 lbs.) for $150 with optional add-ons and a la carte items like shellfish. Low-mercury, allergy-sensitive, and Kosher options are available too for those with dietary needs. IMPORTANT, when you Sign Up, make sure to choose “CSA Location Members” under “payment plan,” which will give you the 5-week winter plan. When you choose a payment option, it lists “weekly” or “bi-weekly” but ignore that—both choices are set for the same amount and both of them get you the 5-delivery plan. Just pick one. If you miss the first pickup date, you can still join for the remaining four dates. And if you want the share but will be on vacation on one of those 5 dates, you can email them and they’ll credit you towards the next round of fish in the summer! You can now order a la carte items from Winter Sun and pick them up on any (or all!) of our winter vegetable delivery dates. Choose from local meats, frozen veggies, maple syrup, applesauce, etc. Also available; goat cheese, goat fudge and goat soap. Read more and learn how to set up an account. Winter deliveries of Lewis Waite items are on TUESDAYS. Chose from a huge variety of local goodies including, meat, eggs, beans, cheese, bread, and so much more! Please check the order deadlines on the Lewis Waite site. The variety of food available through here will keep your supermarket shopping at a minimum! If you’ve never done so, it’s easy- just follow these instructions. Make sure to sign-up for our CSA Yahoo email group to receive important CSA news. There are two kinds of Winter Vegetable Shares: 1. Golden Earthworm’s root vegetable share, and 2. Winter Sun Farms‘ frozen local vegetable share. The two shares complement each other well, so feel free to sign-up for both! In addition to veggies, you can also purchase a Cider Share and/or an Apple Share from Briermere Farms. We will continue to offer fish shares and CSA extras through the winter (details on those coming soon). Online Sign-Up: The easiest way to sign-up for a Winter Share is via the web form link below and pay with PayPal. You can also sign up via web form then pay by sending a check to our P.O. box. If you want a winter share, but can’t sign up online and can’t attend our in-person sign-up, please Contact Us ASAP to make other arrangements. Everyone is required to sign-up for a volunteer shift. We’ve amended the Volunteer Agreement in hopes of curtailing ‘no-show’ volunteer incidents. Please read it carefully before signing off. For most folks, nothing will change, other than we need all Winter Share participants to have signed up for a shift by January 15th, 2014 (by then, 2 of the 5 deliveries will have already passed, so that gives you plenty of time!) Questions? Please Contact Us. Sign-up here via web form or click on the share option below. Because we sold more than 50 Winter Sun shares this year, the farm gave us a $10 discount on each share! If you would like to get your refund via paypal or check (which you can pickup on Dec 20) please fill out this online form before December 19th. If we don’t hear from you, the money will go directly to our Subsidy Program. Remember our first winter vegetable pickup is next Thursday December 20th. 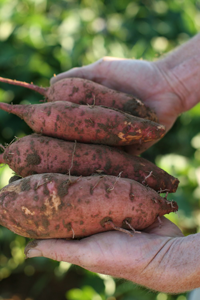 It’s time to sign up for volunteer hours for Winter CSA pick-ups and Lewis Waite pick-ups. If you have signed up for a Winter CSA share from Golden Earthworm Farms or a Winter Sun Farms share this winter, you agreed to fill one volunteer slot this winter during our CSA pick-ups. Each share is asked to fulfill ONE volunteer shift. Winter Share and Lewis Waite volunteer shifts are open on the Volunteer page. 1. Find an OPEN slot on the Volunteer calendar (search through months as needed by selecting a date from drop down calendar). Lewis Waite distribution is once each month on a Tuesday. For these Tuesdays, we need 2 volunteers from 5:45 PM – 7:00 PM and 2 volunteers from 7:00 PM – 8:15 PM (4 volunteers total) to assist with distributing the Lewis Waite orders to members. NOTE: These instructions are for the summer shift so the times are not accurate, however the instructions are correct for Lewis Waite distribution during the Winter. Golden Earthworm and Winter Sun share pick-ups are on every third Thursday starting on Dec 20. Thank you in advance for signing up for a volunteer shift this winter! We cannot have CSA without volunteers helping with our distributions. There are two kinds of Winter Vegetable Shares: 1. Winter Sun Farms‘ frozen local vegetable share (which you’ve been able to sign up for already); 2. Golden Earthworm’s root vegetable share (available starting now). In addition to veggies, you can also purchase a Cider Share and/or an Apple Share from Golden Earthworm. The easiest way to sign up is right here, via the web form links below and pay with PayPal. You can also sign up via web form then pay by sending a check to our P.O. box. Note: Payment must be received by November 15th. Read carefully: The sign ups for Winter Sun and Golden Earthworm are separate—if you want both, you must follow the (two) links below and sign up for each share. We have included a $5 admin fee with each share, but if you get both, you only have to pay the admin fee once! Other good news: we do not have a limit to the number of shares we can offer (tell your friends)! Sign up via web form. Review the contract agreement and pricing details and pay with PayPal or mail us a check. Payment must be received by November 15th. Sign up via web form. Review the contract agreement and pricing details and pay with PayPal or mail us a check. We posted details about the Winter Sun share several months ago on our blog—read more here. Payment must be received by November 15th. Both vegetable shares complement each other well. Winter Sun collects fresh local farm food over the summer and flash-freezes it for consumption in the winter. Their food tastes really fresh, unlike the frozen food you’re used to getting at the grocery store. Golden Earthworm’s share is mostly root vegetables—things that keep over a long time. So if you sign up for both shares, you won’t get much (if any) overlap between the two. *Contents of the share may fluctuate over the week. The next Lewis Waite order deadline is Sunday, October 28th for delivery on November 1st. Anyone, not just CSA members, can order these products and pick up from our CSA. They have an amazing selection of items, all produced by small local farms. Please place your orders for Thanksgiving Turkeys by November 5th to be guaranteed a bird!! 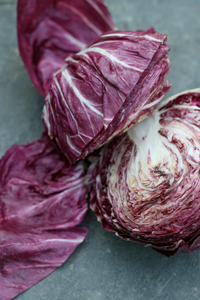 Radicchio, halved. Image via GEOF. Weekly dairy share pick up AND à la carte order pick up! Pick up your Lewis Waite orders today! Forgot to place an order? The next deadline is October 28th for delivery on November 1st. Please place your orders for Thanksgiving Turkeys by November 5th to be guaranteed a bird!! Early bird signup for the Winter Sun Farms winter share continues online. The total price is $137. Read more and sign up online.